If you just purchased a Cuisinart CRC-400 rice cooker you made a good choice. However, for folks who are considering there are some pros & cons you should know about. First, the Cuisinart CRC-400 has a very stylish design, is about the same size as a small 2 slice toaster, and will not take up much counter room. No matter the decor of your kitchen it should fit in quite nicely. Second, is that once you get past the water to rice ratio learning curve it does a fair job at cooking moist fluffy rice…just as good as most “rapid boil style” rice cookers. For cooking just white rice, the Cuisinart CRC 400 excels and seldom should there be any problems. Just carefully follow the instructed measurements and that’s it! But for brown rice you need to add a little more water than normal. This means folks will be limited to only about 3 cups of brown rice or else you pass the maximum capacity and risk boil over. Cooking rice varieties other than white rice with this cooker is where folks seem to be having some issues and therefore giving it bad reviews…we have experienced some as well, but it just takes a little more time to perfect. This Cuisinart 4 cup rice cooker comes with a small steaming basket for preparing vegetables, poultry, and seafood, while cooking rice. However, this tray is quite small and is probably only ideal for 2 people. The unit also comes with a plastic rice paddle, measuring cup, and manual with included recipes. Note: when cooking folks need to keep an eye out since the automatic “keep warm” mode feature may kick in a bit too late slightly crusting the bottom layer of rice. Nothing major but still may prove as a small inconvenience for some. This rice cooker may boil over on several occasions, this strongly depending on rice variety, amount of starch content, and along with the amount of rice added. Some simple tips to help avoid that is to first rinse the rice well, and then add about one teaspoon of vegetable oil per cup of rice. For brown rice, let it soak for 15 to 20 minutes. Also, substitute foil for the glass top lid. 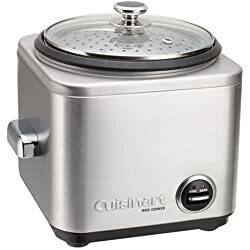 We have also discovered that cooking with chicken broth or adding Herb-ox flavoring helps stop the rice starch from bubbling using the Cuisinart CRC-400 . Warning! Hot to the Touch! Another thing we noticed is that this unit is not “touch friendly”. The top lid is poorly insulated and becomes hot to the touch when cooking, so a little caution is needed. Also, the rim of the bowl is slightly exposed around the top base, and that too becomes hot! So, can we recommend the Cuisinart CRC-400 rice cooker? Simply put, for the price and stylish look we can “kind of” say go for it, but as mentioned above it works best with just white rice. Cooking brown, wild, mixed, etc. may take some getting used to with both CRC-400 and 800 Cuisinart rice cookers. In fact, before spending money at least compare it to others on this site first.